EC Junior Students Discover the Art of Punting! This week our Junior’s boarded the traditional Cambridge Punts and set off down the river Camb. The Junior’s were treated to some history along the river including the story of the St John’s College clock tower, with no clock! One of the bridges along the river route shows the highest flood line ever recorded in Cambridge history. 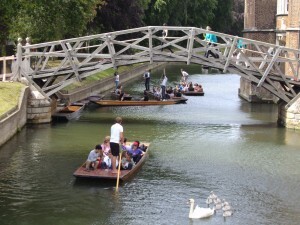 To start with, the students punted under the Mathmatical Bridge which was once held together by nothing but gravity. This is not the only exciting thing to see on the river, the students encountered a river side view of the beautiful Kings College, reminicent of Hogwarts from the Harry Potter films. One of the most breath taking scenes on this trip is the bridge of Sighs, a direct copy of it’s counterpart in Venice. Glorious weather makes this one of the best things to do in Cambridge.